Integrating your calendar with MailChimp allows you to send event newsletters, event updates, and collect email addresses from users interested in your events. To get started, make sure you have an account with MailChimp. They have free accounts, and you only start paying once you exceed certain thresholds of mails sent and subscribers. Make sure you complete the full account information including address. This will appear at the bottom of your emails, and most countries’ anti-spam laws require it to be complete. Mailchimp works with Lists and Campaigns. If these are new concepts to you, start by reviewing Mailchimp documentation of how to setup your lists and campaigns. To get started, make one new list called “test” and add your own email address to the list. 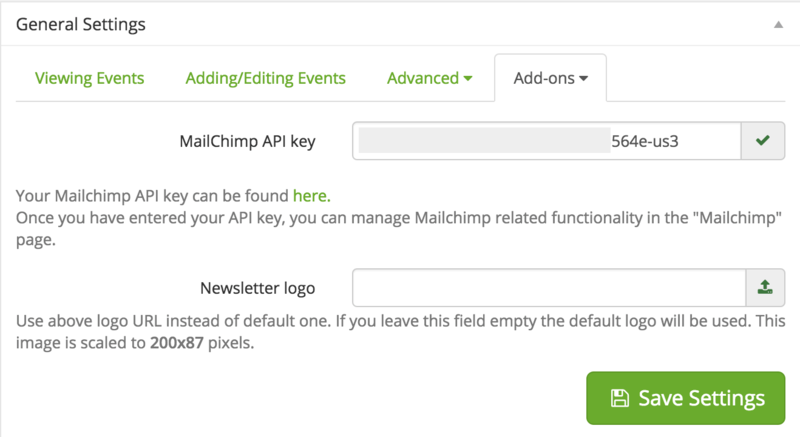 Once you have created your MailChimp account, you need to get your API key. Copy this key and navigate to Events > Settings > Add-ons > Mailchimp. Paste your key into the field and hit save. You should see a little green check next to your key if it was successfully connected to your account. The second field on the settings page allows you to upload a custom logo or image for your email header. If you don’t upload anything, we use the default Timely logo. Newsletters are regularly scheduled emails that include a list of upcoming events for a set period of time. The first setting is the “From email address”. Make sure this matches the email address you set in MailChimp. The “From” name will be used in the subject line of the email if you leave the custom subject field found below blank. Next step is to select your list. To start, you should select the “test” list you created earlier. “Frequency” determines how often the mail is sent, and what events it will contain. Currently you can select “weekly” or “daily”. The emails will contain all your events for these periods of time. Make sure if you are selecting Daily that your users really want to hear from you that often! Next is the Subject, It is fine to leave this blank, the default will use the “From Name”. If you wish, you can also insert custom text and images into your email template. This will appear below the email title and above the events. Again, you are not required to put anything here, it is optional. Mailchimp supports most HTML so you can create titles or bold text in your description. If you are having trouble with certain tags please checkout this document from MailChimp. It details best practices for using HTML in emails. Some site visitors prefer to receive email reminders of events rather than sync them with their calendar. For event notifications to work, you should start by creating a new list in MailChimp. Name it something like “Event Notifications”. Don’t worry, you don’t have to make a new list for each event, once you have one made, Timely handles the rest. Return to your MailChimp settings page and make sure the “from” email matches the one you used in MailChimp. The “From Name” will be used in the default subject line if you do not create a custom one. Select the list you created in the “List” dropdown. The notification period sets the time before the start of the event that the notification will be sent. Using Single Mail you may send custom email newsletters or notifications to subscribers of your choosing. A great use for this might be to send an email notifying subscribers to the event that tickets have gone on sale. Or you may wish to send a custom newsletter about the events in a particular festival. To send an update to event subscribers, start by selecting them from the list. You will notice a new list called “~~ To event(s) subscribers ~~”. This will send the mail to the subscribers of the events you select below. You can select events based on their category and tags, or you can select them individually. You can select any number of events here, so if you have multiple events that require the same message, select them all. Next create a subject, and then enter your description. Don’t forget the events that you selected will be listed below your custom message, so if you are sending a message about an updated time or date, change the information on the event first so it matches the content of your email. To send a more general email, say about certain workshops at an upcoming festival, you may select them, and then select the appropriate list above. Perhaps you would like to send a message to the attendees from the past years event. You would start by creating that list in MailChimp, then selecting it here. You could choose the workshops from the list and then enter your custom message about registration opening soon.